Perhaps the most famous image in The Philadelphia Story (1940) occurs in its opening scene, a shorthand depiction of the vicious break-up of the marriage of C.K. 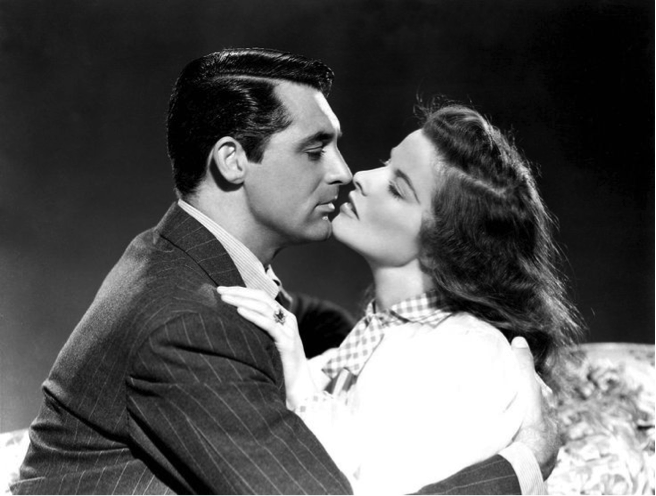 Dexter Haven (Cary Grant) and Tracy Lord (Katharine Hepburn). Bags packed and ready to go, Dexter leaves the house with his last two cases. Clad in her nightgown and an angry, smug grin, Tracy follows him out and throws his pipe rack and all but one of his golf clubs on the ground before him. She then breaks the remaining club over her knee. Dexter, in response, stomps up to Tracy in the doorway, accompanied by the sound of a militaristic drum roll. He mimes a punch, then puts his hand over Tracy’s face and pushes her backwards, hard. We then cut to Tracy, sprawled in the entryway, rubbing a sore neck. In superficial terms, the film is showing us just how bad relations got between Dexter and Tracy. We do not learn why they divorced until later in the film, but we do see that they both lost the ability to comport themselves peaceably. In addition, we see that their shows of frustration differ: Tracy takes her anger out on Dexter’s possessions, while Dexter takes his anger out on Tracy. Why start here? The film might have begun in the present day, letting the flashback in after we see Tracy seemingly happy once more, or after Dexter returns to the Lord home to upset the proceedings. The clearest answer the film gives to this question relates to the subject of blame. Who is to blame for the divorce between this formerly happy, wealthy duo? They seemingly had everything, and then they threw it away. We can be certain they were well-matched because they inevitably end up back together at the end of this romantic (screwball) comedy—not unlike the bickering Walter (Grant) and Hildy (Rosalind Russell) in His Girl Friday (1940). In both films, the woman is discontented with a “difficult” man but is convinced by the end that he is her destiny. [You] never had any understanding of my deep and courageous thirst. Granted, but you took on that problem when you took me. You were no helpmate there, you were a scold. 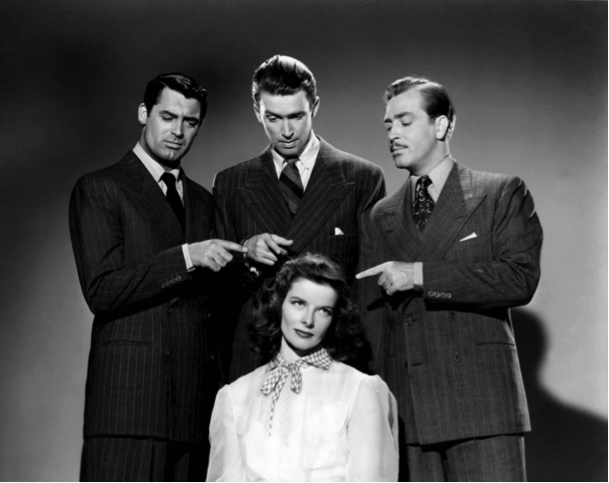 A publicity shot showing how Tracy (Katharine Hepburn) is blamed for everything by the men in The Philadelphia Story (from L: Cary Grant, Jimmy Stewart, John Howard). With such context in mind, we can return to the opening scene to better clarify its meaning. Dexter is leaving, bags packed, but Tracy has to ensure he knows fully that he is what went wrong in their marriage. She feels justified in breaking his personal possessions and chooses ones with particularly phallic overtones. Once she has emasculated Dexter, he must regain his potency, which he does through physical violence, tempered and trivialized by its romantic comedy context. If a man is to blame for his own faults, the scene and its importance within the film argues, a woman is to blame for not helping him to overcome them. If we consider the context of the film as well as its content, we can also note that Hepburn was labeled “box office poison” in 1938, two years prior to the film’s release. The label not only referred to the actress’ recent string of flops but also to popular audience disapproval of Hepburn’s perceived hardness of character, a cold pridefulness unbecoming to a properly feminine celebrity of the era. In this context, The Philadelphia Story portrays not only Tracy Lord’s comeuppance but also Katharine Hepburn’s as well. Beginning the film with a scene in which we see the haughty actress literally pushed down to the floor by rising star Cary Grant (whose flops—two of which co-starred Hepburn—did not harm his career) offered the perfect proof to an audience that an independent, headstrong woman could be humbled.